You know, I thank my lucky stars every day that I have a daughter instead of a son. She's just such a joy and never fails to make me laugh. She loves dressing up, I get to buy her cute little dresses and more importantly (when it comes to my scrapbooking), it allows me to use flowers indiscriminately on my pages. 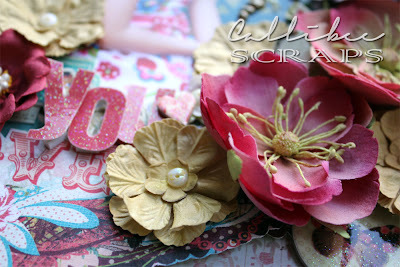 So, what do I do when one of my past kit club packs was filled with Prima papers and flowers? Prima it up, of course. From a simple half hour layout (see below), comes one that took half the night to cut out and stick down. I hand cut the oval frame and pop-dot it to bring it off the page and added lots of flowers, bling and butterflies. Using flowers to frame the photo actually draws your eye to it rather than detract from it. Pretty bling and butterflies climb up the photo. Butterflies are also hand cut and then treated with a thin layer of Stardust Stickles to give them an iridescent shine. 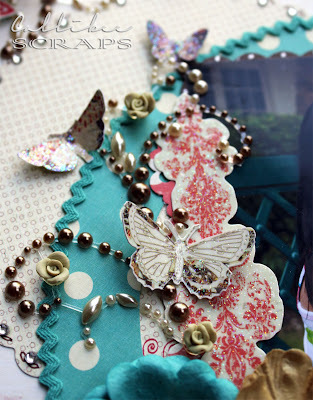 I also added a ric-rac border around the turquoise paper to make it stand out. Prima makes such pretty flowers that you can't help but stick them all onto your page.